Purina has voluntarily recalled some cans of Muse cat food. 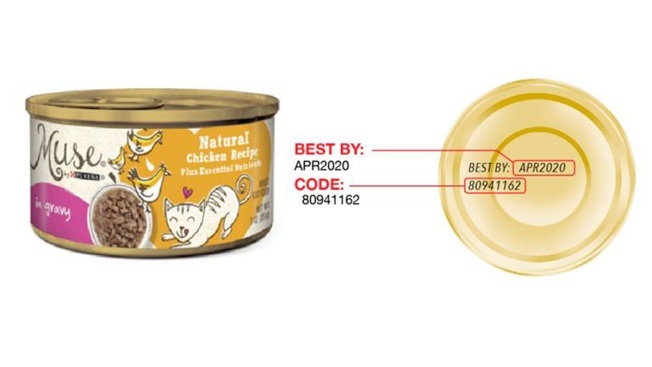 Purina has voluntarily recalled some cans of Muse wet cat food due to the potential presence of rubber pieces, the FDA says. Nestle Purina PetCare Company announced the recall Friday for 3-ounce cans of the Natural Chicken Recipe in Gravy. The food could contain rubber pieces that are "translucent yellow with a blue backing," which presents a choking hazard, the company said. Pet owners complained about finding the rubber pieces, Purina said. There were no reports of injuries or illness. "We have made changes to our process so this should not happen in the future," the company said in a statement. The affected cans were distributed nationwide. They have the UPC code: 38100 17199; the "best by" date: APR2020 and the production code: 80941162. Anyone with questions can call 1-800-982-3885.